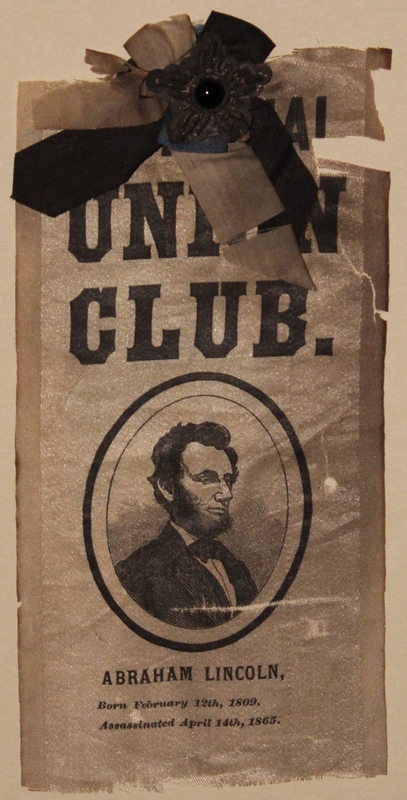 A note included with this object reads: “Badge worn at the funeral of / President Abraham Lincoln / by National Union Club / property of Jacob Laudenslager / one of the organizers and a Captain of / the First Regiment National Guards of Pennsylvania / that was equipped by the Union League / presented by his grandson Jacob Laudenslager Read.” The National Union Club, unrelated to the Union League, was headquartered at 1105 Chestnut Street in Philadelphia. These silk ribbons were printed for members to wear during President Lincoln’s funeral procession. The silk ribbon is embellished with black metal stars and black, white, and blue ribbons. There is a second silk ribbon in the collection that was donated by the same individual.